Today is Batman Day—a day devoted to celebrating the legacy of the most popular comic book character out there. It’s quite a legacy. For 77 years, Batman stories have been told in comics, movies, animation and video games. That means that for nearly eight decades, not a single day has gone by in which someone hasn’t been creating stories for the Caped Crusader. Some of those people have become legendary—Bill Finger, Dennis O’Neill, Frank Miller, Tim Burton, Paul Dini, Christopher Nolan. Others may not be as well known, but all have contributed to the history of a character who remains one of the most recognized figures worldwide. Tom King is the latest in this line of amazing creators. The current writer of Batman’s core comic book series, Tom began his tenure with the start of Rebirth, and recently concluded his first story arc, “I Am Gotham.” But if you missed it, today’s a great day to start getting caught up. The first issue is available today for free at thousands of comic shops and bookstores for Batman Day, and is also available for download at your favorite digital retailer. With his first storyline done and his hero currently in the zeitgeist, it seemed like the perfect time to sit down with King for a chat about the Dark Knight, where his storyline is going, and how he feels about adding to those 77 years of heroics. Congrats on an amazing first arc. I wasn’t really sure what to expect from Gotham and Gotham Girl, but in the end they broke my heart. How big of a role will Claire be playing in Batman’s story going forward? She’s in it for the long term. She’s in there till the end of these three stories we’re doing: “I Am Gotham,” “I Am Suicide” and “I Am Bane.” She’s the driving force behind them. But unfortunately, she’s sort of out of commission for most of it. She’s been infected by the Psycho Pirate’s fear. She needs to get that out of her head and the only one who can do that is the Psycho Pirate himself. So to save Claire—to save this one last remnant of this hope he has in issue #1—Batman has to find Psycho Pirate, and that mission leads him directly into Bane. You ended issue #5 with a pretty cryptic voiceover given by Claire. Is that basically what you’re building towards with your story? When will we find out more about what she was talking about? I am building towards that! At the end of issue #5, Claire talks about how she and Duke get married and that she basically kills Batman. That’s a huge story, and it’s going to play out for a long time. I don’t want to give it a limit because it’s going to be the underlying rumblings of my entire run on Batman. Grant Morrison said it best. He said during your run you have to give Batman a death and you have to give him a birth. We gave him a birth, that was issue #1, and we’ll eventually give him a death. Next week, we kick off “Night of the Monster Men.” How would you describe this storyline? Is it horror? “Night of the Monster Men” is still a super hero story. It’s about good triumphing over evil, but it uses elements of huge horror, old kaiju films and a little bit of that absurd Jack Kirby/Stan Lee pre-Fantastic Four “the world against monsters” kind of stuff. It’s a combination of all those elements. Everyone working on these books knew that Detective Comics would be ending with what happened to Tim and Batman would be ending with what happened to Gotham and Gotham Girl. We had these sort of minor note endings and we wanted to follow that with something big, bombastic and fun. Gotham City is about emotion, but it’s also about Batman saving the day, and that’s what this is. It’s a huge story about Batman fighting the worst of the worst and coming out hopefully on top. You’re working with a bunch of other writers on this one. What’s the process been like? The process has been super easy for me. From the beginning we said that [all the Bat-book writers] were going to do their own thing for five or six issues. But the whole point of Rebirth—and I strongly believe in it—is to show how we’re looking at a shared universe now. That every time you look at a DC comic book, you’re looking at a window into a universe. You’re not looking at a window into my mind, you’re looking at a window into the DCU. We wanted to make sure that we touched on that immediately, so that we didn’t get lost in our own writing. So we had this marked—we’re going to do this one event where all of us have to face one threat. We all have to land in one place and then start from a place together. From the beginning, we decided to have one writer take the lead on this so it’s consistent and much better than if three different writers were trying to write different chapters. Steve Orlando was available and he’s brilliant. He’s one of my favorite DC writers. So we bashed around a few ideas and Steve took those vague ideas of monster men and Hugo Strange and wrote the script, and he turned it into something awesome. Ah, I’m so excited about it! It sounds like it’s going to be awesome! 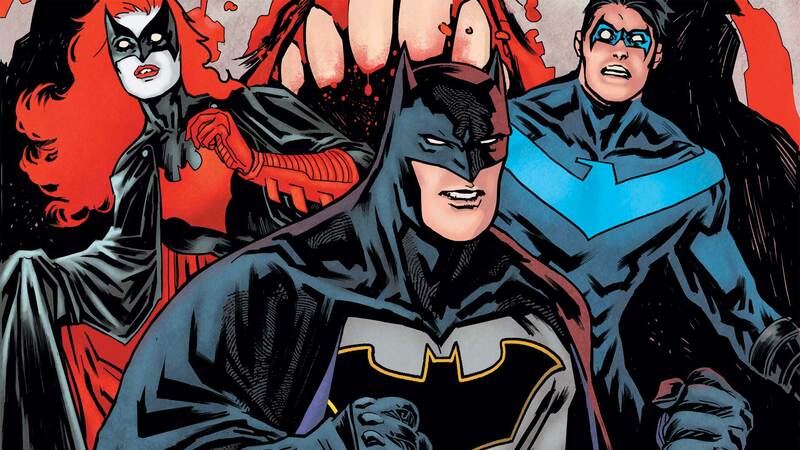 So can we take from the title that Batman will be teaming up with the Suicide Squad? It’s not Batman working with the Suicide Squad. It’s Batman forming his own Suicide Squad. It’s Batman working with Amanda Waller, going into Arkham Asylum and picking out a special team to accomplish a mission that he can’t do on his own or with the Justice League. If you’ve read the end of BATMAN #6, you know that Bane has the Psycho Pirate, who can cure Gotham Girl. Batman needs to get him, but Bane lives in his own country. On top of that, he lives in a prison that’s the worst prison in the history of humankind. So Batman can’t just go in there because it’s illegal and impossible. So he needs a team who can do something illegal and impossible, and that’s the mission of the Suicide Squad. That’s where we start, with Batman making his own Suicide Squad to invade Santa Prisca and try to get Psycho Pirate back from Bane. I find it interesting that Psycho Pirate has played such a key role in these first two storylines. He’s kind of a fringe character. Was it always your plan to use him? Are you a Psycho Pirate fan? I don’t think of him as a fringe character. He plays a huge part in CRISIS ON INFINITE EARTHS. That’s where I was first introduced to him. He’s the guy who kills Barry Allen! So he’s played a role in the DCU for years. And then Grant Morrison took him into ANIMAL MAN and made him the one character in all of DC continuity who can remember the Multiverse. He remembers what happened beforehand. So he has both those aspects of him—he’s played a key role in this huge crossover and he also has this bizarre memory. He’s this huge character…and he’s a wimp. He’s a nobody! He’s terrible. He’s always manipulated by other people. After Jessica Jones came out, I think people saw the seriousness of the Purple Man and the idea that one person who could take over a mind could take over the world. That’s what Psycho Pirate can do. I just think there’s a lot there. It wasn’t a tough pick. Batman is now over 75 years old. There are so many stories that have been written about him before you got your chance at the character. As a writer, how do you tackle a character like that? With respect to everything that’s come before, how do you tell a story knowing how many other great Batman stories are out there? There are a few things you do. First of all, if you’re not writing from truth or writing from yourself, then it’s meaningless. Everybody’s experienced Batman, but they haven’t experienced my Batman. They haven’t experienced a Batman through the lens of a guy who was in the CIA, who’s seen some crazy, sad, weird, wonderful crap and gone through the experience of my life. So that’s part of it. You put yourself into it. The other half of it is that you use that 75-year history to make it awesome. That’s not a weakness of this character, the fact that everything’s been done before. That’s a strength. You can build upon all of that. I can have a scene with Kite Man—a one-page scene in issue #6—and it’s so much fun and wonderful because Kite Man’s a character from thirty years ago that fans remember fondly. You take that history and you make it work for you. You show all of that stuff—all of those writers and all of their contributions. You find what’s essential to them and why it stuck. Finally, of all of Batman’s qualities and attributes, what’s the one that really speaks to you? To me, it’s his mortality. It’s the idea that he could die—that he’s human. There’s something about Superman and Wonder Woman that says to me that they go on forever. If you came to Earth one hundred years from now, Superman and Wonder Woman would still be here. But Batman’s like one of us, right? He can die. He has that risk factor to him, and every time he goes out at night, he faces that and still triumphs over it. That just makes him the most human character in the DCU to me, the idea that he’s not a god. He lives among the gods and tries to do his best. You can pick up a special edition of BATMAN #1 by Tom King, David Finch, Matt Banning and Jordie Bellaire today at participating Batman Day locations. Look for the start of "Night of the Monster Men" next week in BATMAN #7. This Just Happened: A 'Squad' Member Falls, and the Secret of The Black Vault is Revealed!